This little addon will add buttons to the crafting stations top left side which will easily filter your items located at your bank from the crafting station's panel. It will distinguish the different crafting stations (blacksmithing, clothing, woodworking, enchanting) and their different panels. With 1 click on the button you can change which items are shown: Only bank, only inventory, both. The standard settings only switch between "show inventory items" and "show all items". 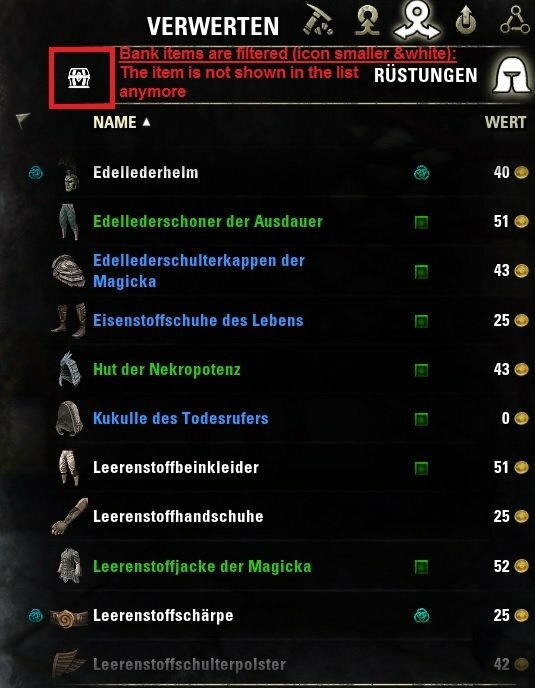 The tooltip of the button shows you what items are currently shown and which ones are hidden. You can add a 3rd state which will only show the icons in your bank. and enable the extra "medium" filter to ONLY show the bank items. This addon was coded upon request (ingame). This addon won't include the needed libraries anymore since this version 0.2.1! YOU need to manually download & install them. Be sure to check if your extraction software e.g. WinZIP, WINRAR, etc. did create a folder with the name of the zip file and has put the contents of the zip file in there: THIS IS WRONG! The contents of the zip file need to be in your AddOns directory (e.g. 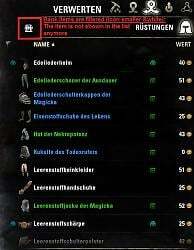 c:\users\your windows username\documents\elder scrolls online\live\AddOns) without a new created subfolder with the name of the zip file!. Please read the description for further details and the reason. Thanks for your support! -Removed the libraries (see addon description, changelog and comments for more details). Added option to use the game client's language. Fixed incompatibility bug with addon "Multicraft"
Added feature: "Show only bank items"
is there a way to see also items from storage chests when at crafting station? Updated the comment on the plugin. No way. Storage chests can onlyx be viewn if you are inside your house. This is a game limitation. 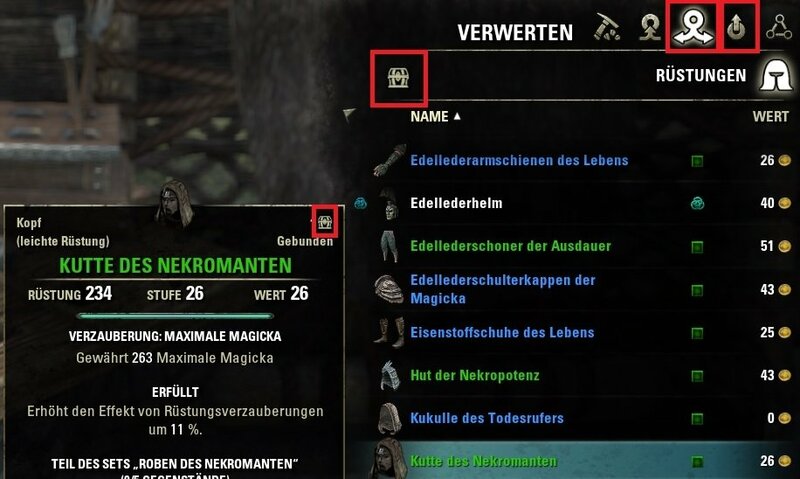 If you want to see items in your storage chests elsewhere you need to use addons like "Inventory Insight" which scan and save the items to your SavedVraiables. even if you inside your house, using your crafting stations? As long as you are in your house you can have access to the house chests. If outside you cannot. So if you are using a crafting station in your house and have opened the chest BEFORE to update it, one is able to read the contents of the house chest. But they won't be shown at any crafting station inventory list as this is not supported in the game. Crafting stations = Inventory bag + bank. No guild, house or other banks/chests. Even if you would try to squeeze them in there, the base game would just filter them each time again after you have scrolled, done something etc. So it makes no sense and probably won't work at all. Last edited by Baertram : 03/10/19 at 11:05 AM. Last edited by Baertram : 03/10/19 at 06:08 AM. Last edited by Marazota : 03/10/19 at 05:51 AM. can also add switch to show only duplicates? Last edited by Marazota : 03/05/19 at 01:21 PM. That only happens when the person who created the .ZIP file did not do it correctly. I've been using PKZip since about 1988, so don't blame the players if the addon files are not extracted correctly. Are you kidding me? This happens if the software used to extract the files creates a new folder, this is no addon author problem but software problem. Check WinRar, WinZip, etc. All these provide this option and have enabled it in their standard. Not everyne is using your software (its unknown to the most). If you try to look more impressive by writing in BIG LETTERS... the content is more important. And before you ask: my information was written in big letters because "it matters" and "happened several times"
Last edited by Baertram : 02/27/19 at 03:25 AM. -> Be sure to check the extraction of the zip files! They must NOT create another subfolder in AddOns containing the name of the zip archive itsself! cool addon what about Research? it possible when researching items limit a choice for research only from items from your inventory? It's not that easily doable as you'd need to overwrite ZOs functions. I'm not planning to add support for this if there is no other way. I don't like to "overwrite" functions. If they change in the base game I might destroy the game code with it if it's not adopted each time (takes too much time to check, update and maintain). Last edited by Marazota : 01/20/19 at 12:27 PM. Don't let the trolls get to you, friend. You've been an amazing asset to the community with your mods. Sending you hugs and gratitude! Nope, game filters split this into armor and weapons. As within AdvancedFilters too where I cannot tell the addon to show "Cosnumable items" at the "Armor tab", ecause the game pre-filters this already, this will work the same way here. If I change this I'd have to re-code everything in the base game filter + crafting + check + ... functions. This would seriously damage/break several addons + the base game for sure, AND it would take for ages. Last edited by Baertram : 11/12/18 at 05:01 AM.